In Sony Pictures' family adventure-comedy RV an overworked executive, Bob Munro (Robin Williams), persuades his wife and children to give up their Hawaiian vacation for some 'family bonding' on a cross-country RV trip. But it's all a ruse. Bob has other, more career-oriented reasons on his mind than sending quality time with his family in the Rocky Mountains. Through a series if misadventures, including constant run-ins with an overly friendly troupe of full-time RV'ers, Bob inadvertently learns the true meaning of family. $16.414 million on 3639 screens. 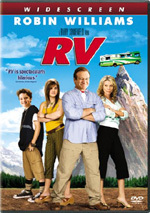 With 2006’s RV, we get one of Robin Williams’ infrequent stabs at wacky comedy. Williams plays Bob Munro, a harried businessman whose teen kids don’t care for him. Bob misses the days when the whole family was close, and he hopes that a summer trip to Hawaii will restore some of that unity. However, Bob’s neurotic and controlling boss Todd (Will Arnett) drops a major work assignment on him and forces a cancellation of the trip to Hawaii. As a replacement trip, Bob rents an RV and decides to drive the clan to his business appointment in Colorado. Thus he loads wife Jamie (Cheryl Hines), daughter Cassie (Joanna “Jojo” Levesque) and son Carl (Josh Hutcherson) into the RV and they head out on the road. The trip presents plenty of awkward moments, many of which stem from Bob is the only one who likes the journey’s idea. Matters get even nuttier when Bob meets Travis Gornicke (Jeff Daniels) and his family. Travis, wife Mary Jo (Kristin Chenoweth), and kids Earl (Hunter Parrish), Moon (Chloe Sonnenfeld) and Billy (Alex Ferris) all live on the road. Their form of down-home charm doesn’t exactly hit it big with the Munros, so the latter clan spends much of their time in an attempt to avoid the former. The movie follows all the involved adventures along with Bob’s work to keep his job. Based on its trailers and reviews, I expected the worst from RV. In truth, the flick offers some charms. Not a lot, granted, but enough to make it reasonably watchable across its 99 minutes. Here’s a sentence I never thought I’d write: when RV works, it does so due to Williams’ performance. I was never a big fan of his shtick, and his move into the weepy-sappy-sanctimony of Patch Adams made me really grow to dislike him. Williams’ work here doesn’t cause me to re-evaluate his oeuvre, but I must admit he produces more than a few laughs. Perhaps that’s because he actually reins himself in for once. The Williams of RV largely avoids prior pitfalls. He doesn’t play too big, and he also stays away from too much cheap emotion. In fact, the movie’s big hug of a climax almost feels touching. Sure, it’s predictable cheese, but it’s not as painful as expected. My main problem with RV stemmed from its desire to be so relentlessly big and wacky. The Gornickes represent that trend. Frankly, they’re pretty useless characters. RV would work just fine as a Vacation-style romp across country. Instead, it adds the Gornickes as a pointless plot device. They distract from potential laughs and rarely add to them. In the same vein, RV usually plays it too big. The movie often goes way too far into idiocy. It leaves the realm of reality too quickly and without much humor. A greater emphasis on actual family conflict would work better than all the over the top set pieces. These become too unrealistic and never seem funny. Still, I gotta admit RV was better than I expected. It may offer hit or miss laughs, but since I thought it’d include no laughs at all, that should count for something. This is thanks to Robin Williams’ most effective work in quite some time. He takes some tepid material and forms amusement with it. It’s not a classic, but it has its moments. RV appears in an aspect ratio of approximately 2.35:1 on this single-sided, double-layered DVD; the image has been enhanced for 16X9 televisions. While generally attractive, the picture of RV presented a few too many problems for a brand-new movie. Sharpness was a bit erratic. Most shots displayed good definition, but more than a few exceptions occurred. Some wide shots appeared somewhat soft and unfocused. I noticed no issues with jagged edges or shimmering, but a little edge enhancement was visible. I saw no signs of source flaws, though, as the movie always seemed clean. With all its different exterior settings, RV boasted a varied palette. The movie demonstrated nicely vivid and lively colors at all times. The tones were dynamic and came across well. Blacks seemed fairly deep and dense, but shadows tended to appear slightly dense. Low-light shots were acceptably visible but not as smooth as I’d expect. Ultimately, this led to a watchable but up and down transfer. The Dolby Digital 5.1 soundtrack of RV seemed more consistently pleasing, though. While the soundfield maintained an emphasis on the forward channels, it broadened the spectrum nicely and opened up the proceedings well. In the front, music displayed fine stereo imaging, while effects blended cleanly and showed good spatial delineation. Elements appeared appropriately placed and moved convincingly across the domain. Surround activity didn’t seem heavy, but I felt impressed with the rear support given the genre in which the film fell; most comedies barely use those speakers. 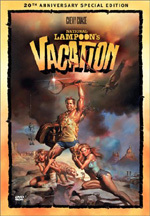 Despite its forward emphasis, RV often made solid use of the surrounds, especially as the movie progressed. Lots of shots from the road broadened matters in an effective way; various elements zoomed around the spectrum and created a solid setting. Audio quality appeared strong as well. Dialogue sounded natural and distinct, and I discerned no issues related to intelligibility or edginess. Music seemed bright and bold and showed nice clarity and dynamic range. The music popped from the speakers in a positive way. Effects came across as accurate and lively, and they packed a surprising wallop. The film featured a lot of deep bass, and those tones sounded deep and tight. Ultimately, the soundfield of RV seemed just a little too passive to earn more than a “B+”, but it still provided a strong auditory experience. As we move to the package’s extras, we open with an audio commentary from director Barry Sonnenfeld. He presents a running, screen-specific discussion. Actually, Sonnenfeld offers a “telestrator commentary”, which means that he occasionally doodles on the screen to illustrate his points. This added a cute but inconsequential part of the track. It didn’t harm anything, but it didn’t help either, so feel free to ignore the telestrator parts and just listen to the piece. During his chat, Sonnenfeld discusses sets and locations, the film’s RVs, inspirations and autobiographical elements, visual design and camerawork, actors and performances, music and visual effects. Like prior Sonnenfeld commentaries, the director infuses the piece with a fair amount of humor, though some of his bits fall flat. His allusions to the Columbia logo’s resemblance to Annette Bening for the umpteenth time – I think he did this with his Men in Black pieces – and his constant references to his own cameos in the flick get tedious. Add to that a bit of dead air and this commentary doesn’t quite excel. Nonetheless, it covers the basics pretty well and gives us more than a few nice insights. Though flawed, Sonnenfeld’s commentary merits a listen. A Gag Reel fills out five minutes and seven seconds. Most of the clip shows the usual array of goofs and giggles. However, the presence of Williams means we get some decent ad-libs and funny moments. A series of five featurettes follows. Barry Sonnenfeld: The Kosher Cowboy lasts nine minutes, 13 seconds. Like its mates, it mixes movie clips, behind the scenes bits, and interviews. We hear from Sonnenfeld, wife Susan “Sweetie” Ringo, producers Doug Wick and Lucy Fisher, and actors Cheryl Hines, Robin Williams, Kristin Chenoweth, Joanna “JoJo” Levesque, Chloe Sonnenfeld and Jeff Daniels. “Cowboy” presents reflections on Sonnenfeld. He discusses his affection for cowboy gear, his cameo in the flick, his neuroses, his visual style and his tone on the set. The material can be fluffy, but more than a few fun moments appear, mainly due to the footage from the shoot. This is a pleasant little program. For a look at the movie’s teen idol, we go to the four-minute and 55-second JoJo: The Pop Princess. It includes remarks from Levesque, Wick, Fisher, Williams, and actors Hunter Parrish and Josh Hutcherson. We learn about Levesque’s casting and her performance. The inevitable puffery occurs as folks tell us how great JoJo is, but the actress presents some decent notes about her experiences. We learn about recreational vehicles in RV Nation: The Culture of Road Warriors. It goes for 11 minutes, 33 seconds and features Sonnenfeld, Williams, Hines, Daniels, Chenoweth, Wick, Fisher, Hutcherson and picture car coordinator Rick Rasmussen. The filmmakers talk about their youthful car travel experiences and family vacations as well as thoughts about RVs. This is reasonably interesting, though I’d prefer more details about RVs, maybe a history of them and specifics about various models. It’d also be good to learn more about the RVs used in the flick. Another actor spotlight comes with the five-minute and 15-second Robin Williams: A Family Affair. The featurette presents notes from Williams, Sonnenfeld, Wick, Hines, Fisher, Daniels, Chenoweth, Parrish, Levesque and Hutcherson. We learn about Williams’ casting and his performance. Not a lot of information appears, but we see lots of amusing ad-libs from Williams. That makes it worth a look. For the final featurette, we get The Scoop on Poop. It goes for three minutes, 49 seconds and offers comments from Sonnenfeld, Williams, Wick and assistant special effects Rae Reedyk. “Scoop” looks at the film’s sewage removal scene. We see what elements went into that disgusting sequence. It’s a surprisingly interesting little glimpse behind the scenes. Three outtakes appear under the banner RV Reveries. We find “Jamie Sings” (3:25), “Cassie Sings” (3:17) and “Carl Sings” (3:14). Each one gives us an isolated look at the various actors’ crooning in the combative scene on the RV. It’s strangely entertaining and a fun way to see the actors at work. Five Storyboard-to-Film Comparisons follows. We get these for “Sewage Dump” (five minutes, three seconds), “Bus Chase” (2:10), “Diablo Pass” (2:05), “Teeter Totter” (3:17), and “Bike Chase” (2:27). For each one, the storyboard fills most of the screen; the final film footage pops up in a small box in the lower right-hand corner. This offers an effective way to present the material. I’m not a big fan of storyboards, but these are reasonably interesting to see. An Alternate Scene appears next. “Kung-Fu Master” goes for one minute and 53 seconds. It shows a different version of the sequence in which Bob keeps kids from beating up Carl. It goes down a very different path so it’s fun to see. We can also dig up an Easter Egg. Go to the “Previews” menu and click right twice to highlight the “RV” on the cactus. Press enter to watch a 67-second clip with Sonnenfeld. He welcomes us to the egg and tells us what he likes about DVD extras. It’s not a very interesting bonus – wouldn’t it make more sense as an intro to the alternate scene? The DVD includes some Previews. The disc opens with ads for Monster House, Open Season, and Zoom. In the “Previews” area of the package, we get clips for Talladega Nights: The Ballad of Ricky Bobby, The Pink Panther (2006), Are We There Yet? and Daddy Day Care. A hit or miss comedy, RV has its moments of humor. Unfortunately, it also comes with many unfunny sequences and it never quite catches fire. The DVD offers decent picture and extras plus pretty solid audio. This one might merit a rental for Robin Williams fans, but don’t expect a lot from it.